Dave Gunn on how ebook tech helps readers with disabilities and opens a new publishing market. Dave Gunn: RNIB’s work on accessible publishing standards began with our foundation in 1868 when we were known as the “British and Foreign Society for Improving Embossed Literature for the Blind.” Focused primarily on the provision of materials in Braille and other tactile formats, we were involved in leading work on the development of standards and production technologies. At the end of World War I, many soldiers had lost their sight in action and returned home to a society ill-prepared for their needs. RNIB was involved in pioneering work to record audio versions of books, developing prototype technology called long-play recordings — a recording standard that was eventually adopted by the music industry. The technology at the time was a big leap forward, even if it wasn’t that practical, as a single “Talking Book” was typically played back over 10 double-sided 12-inch long-play records. What’s the current state of accessibility standards? 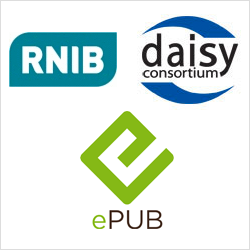 The vision of the DAISY Consortium, is “a world where people with print disabilities have equal access to information and knowledge, without delay or additional expense.” Developments in ebook formats and readers/players mean that this vision has come a big step closer to being realized. The United Nations Convention on the Rights of Persons with Disabilities requires governments to provide accessible information. Are there current processes that publishers can adopt so they don’t reinvent the wheel?